One of the things I love most about Christmas is the luxury of being able to wallow in classic movies, in particular seasonally-based ones. And while many Christmas films turn the sentimentality and schmaltz up to 11, some of the greatest examples of the genre are those with a darker side. Often this serves as a counterpoint to the traditional festivity of the Christmas season, taking our heroes on a quest or a path to redemption before delivering the requisite all’s-well-that-ends-well finish in a happy, usually snow-bound scene. So here are my favourite Christmas films, culled ruthlessly from a shortlist which also included such gems as Miracle on 34th Street, A Charlie Brown Christmas and The Muppet Christmas Carol (but not Bad Santa or Elf.) They didn’t make the final cut, but here are the five that did. A selfless and compassionate man driven beyond despair, George Bailey is on the verge of committing suicide on Christmas Eve when Clarence Odbody, a trainee angel, intervenes. Clarence shows George what his life would have been like if he had never existed, and how much worse the lives of so many people in the small town of Bedford Falls would have been without him. 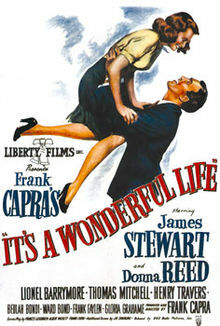 It’s A Wonderful Life – based on a Philip van Doren Stern short story – was the first post-WWII collaboration by director Frank Capra (Mr Deeds Goes to Town, Mr Smith Goes to Washington, Arsenic and Old Lace) and James Stewart (Mr Smith Goes to Washington, Harvey, Rear Window). Over 60 years on, it remains a simple and beautiful tale of a man who consistently puts the good of others ahead of his own, and how this eventually pays off in his darkest hour of need, as the entire town rallies around to support him. I’ve watched the film maybe five or six times now – most recently last weekend – and without fail the ending has me sobbing uncontrollably every time. Without reservation, I say this is the perfect Christmas film – and it takes pride of place at the top of my list. 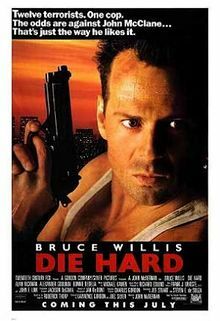 If It’s A Wonderful Life is my undisputed favourite Christmas movie, then Die Hard is a close and honourable second. It would be fair to say that Die Hard is not your typical seasonal film. John McClane, a New York cop, arrives in LA to attempt a reconciliation with his estranged wife, Holly Gennaro, at a Christmas Eve party. However, a group of terrorists led by Hans Gruber (the wonderfully menacing Alan Rickman, making his big screen debut) takes all the partygoers hostage. They demand the release of terrorist prisoners as cover for a daring robbery. McClane takes on the entire gang single-handed, aided on the outside by a single uniformed cop, Al Powell, as a combination of the news media, LAPD and FBI serve only to make matters worse. Based on a Roderick Thorp novel, the film was directed by John McTiernan who has an accomplished CV of taut, often claustrophobic action films (Predator, The Hunt For Red October, The Thomas Crown Affair) – but Die Hard is arguably his finest accomplishment. Casting the balding Bruce Willis – then known only for his turn in the detective comedy-drama Moonlighting – as the action hero lead was a risky but inspired decision. At turns deadpan funny and deadly serious, Willis pitches the character of McClane, an all-too-destructible man in a seemingly indestructible white vest, to perfection. Armed only with a gun and an arsenal of one-liners (“Yippee-ki-yay, motherf*****!”), McClane emerges battered and bruised, but ultimately victorious and alive. The film launched Willis as a bona fide A-list Hollywood star whose career sadly never touched the same heights again until his roles in M Night Shyamalan‘s two break-out hits – The Sixth Sense and Unbreakable – more than a decade later. Die Hard is not just a great action film. It is not just a great Christmas film. It is a great film, period. Fun facts: The original film poster did not feature an image of Willis, as it was thought it might deter people from seeing the movie. The line “Yippee-ki-yay, motherf*****!” is used in all four Die Hard movies, and was voted number 96 in Premiere magazine’s ‘100 Greatest Movie Lines’ in 2007. The worst thing that ever happened to me was on Christmas. Oh, God. It was so horrible. It was Christmas Eve. I was nine years old. Me and Mom were decorating the tree, waiting for Dad to come home from work. A couple of hours went by. Dad wasn’t home. So Mom called the office. No answer. Christmas Day came and went, and still nothing. So the police began a search. Four or five days went by. Neither one of us could eat or sleep. Everything was falling apart. It was snowing outside. The house was freezing, so I went to try to light up the fire. That’s when I noticed the smell. The firemen came and broke through the chimney top. And me and Mom were expecting them to pull out a dead cat or a bird. And instead they pulled out my father. He was dressed in a Santa Claus suit. He’d been climbing down the chimney… his arms loaded with presents. He was gonna surprise us. He slipped and broke his neck. He died instantly. And that’s how I found out there was no Santa Claus. 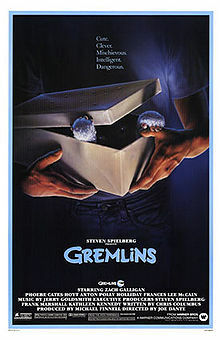 Teenager Billy Peltzer (Zach Galligan) is given a small, cute, furry Mogwai named Gizmo as a Christmas present. Billy accidentally spills water on Gizmo, spawning five more Mogwai, who trick him into feeding them after midnight. This turns them into menacing reptile-like creatures which he dubs ‘Gremlins’. The Gremlins go on the rampage, terrorising the townsfolk on Christmas Eve before Billy, aided by Gizmo and his would-be girlfriend Kate, fight back. What do you get if you combine the Muppets, horror and a dash of comedy, all wrapped up in a Christmas story? I would love to have been a fly on the wall when the concept for Gremlins was pitched to Warner Brothers. Somehow, the project was green-lighted – and it worked brilliantly. Written by Chris Columbus (who went on to direct Home Alone, Mrs Doubtfire and the first two Harry Potter films) and directed by Joe Dante (Innerspace, The ‘burbs), Gremlins veers happily between the macabre (Kate describing the death of her father in the above quote) and the comedic, with the ground-breaking animatronic Mogwai and Gremlins stealing the show. The film is packed full of memorable sequences, not least the Gremlins watching Snow White and the Seven Dwarfs in the town cinema and Billy’s mother disposing of three Gremlins in her kitchen thanks to a microwave, a blender and a knife. Somewhat bizarrely, the film received its initial theatrical release in the summer of 1984. Go figure. Fun facts: ‘Mogwai’ means devil, demon or gremlin in Cantonese. Billy’s mum is seen watching It’s A Wonderful Life in her kitchen. You know, it occurs to me that the best way you hurt rich people is by turning them into poor people. 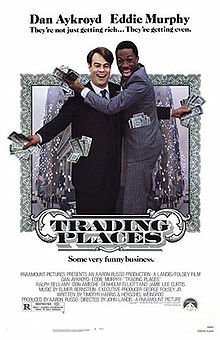 Multi-millionaire commodity brokers Mortimer and Randolph Duke make a wager on whether they can turn a common criminal, Billy Ray Valentine (Eddie Murphy) into a successful businessman, while seeing whether their educated, well-mannered managing director Louis Winthorpe III (Dan Aykroyd) resorts to crime when he is stripped of all his privileges. But once Billy Ray and Louis get wind of their game, they work together to turn the tables on the Dukes. Director John Landis is perhaps best known as the man behind Animal House and The Blues Brothers, but Trading Places is vastly underrated as both a Christmas morality tale and a work of comedy genius, with its two stars still on upward career trajectories at the time. Murphy had only recently graduated from Saturday Night Live with his break-out role in 48 Hrs, and would go on to confirm his A-list status in the Beverly Hills Cop series. Aykroyd had already starred in the seminal The Blues Brothers and would score another smash hit with Ghostbusters the following year. Trading Places is that rarest of beasts: an out-and-out comedy which offers an unusual degree of depth and social commentary, but without allowing it to disrupt the breakneck flow of jokes. With a cracking script, Murphy and Aykroyd in sparkling form, and a top-notch cast which includes Ralph Bellamy, Denholm Elliott and Jamie Lee Curtis, the film represents a genuine ‘lightning-in-a-bottle’ moment for mainstream Hollywood comedies. There have been few funnier movies made before or since. Fun facts: Louis’s prison number is 7474505B, the same as Jake’s in The Blues Brothers, also directed by Landis and starring Aykroyd. The characters of Randolph and Mortimer Duke later appear in the Eddie Murphy film Coming to America as two homeless men. This is my house. I have to defend it. Eight-year old Kevin McAllister (Macaulay Culkin) is accidentally left behind by his family as they hurry off to a family vacation in France. 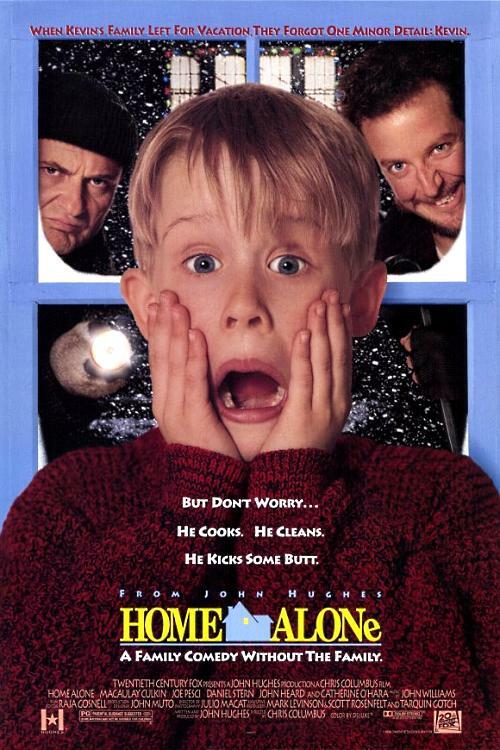 Being home alone is fun at first, but things turn serious when Kevin discovers two burglars, Harry and Marv, are about to rob his house, and he has to set a series of traps in order to stop them and bring them to justice. Written by John Hughes, the writer/director behind The Breakfast Club, Ferris Bueller’s Day Off and Pretty in Pink, and directed by Chris Columbus, Home Alone is a touching and funny (if somewhat implausible) movie that contains some fantastic moments of slapstick at its denouement. Home Alone made the 10-year old Culkin – who is outstanding here – the highest-paid child star ever, catapulting a career which soon lost its initial trajectory. The supporting cast, which includes comedy veterans such as John Candy and Joe Pesci, is superb, but it is Culkin who turns a very good children’s film into a great family one. Fun facts: The film posters had Culkin with his hands on his face and screaming, in imitation of the painting ‘The Scream’ by Edvard Munch. The film the McAllister family is watching in their hotel is It’s A Wonderful Life – funny how often it pops up in other films, isn’t it? Posted in Entertainment, TV & film and tagged Alan Rickman, Bruce Willis, Chris Columbus, Christmas, Dan Aykroyd, Die Hard, Eddie Murphy, films, Frank Capra, Gremlins, Home Alone, It's A Wonderful Life, James Stewart, Joe Dante, John Hughes, John Landis, John McTiernan, List of Christmas films, Macaulay Culkin, Philip van Doren Stern, Roderick Thorp, Trading Places, Zach Galligan. Bookmark the permalink. I love the Home Alone movies! I’ve only seen the first one, I have to admit. But it was well worth inclusion on the list. It appeals to my inner child, that’s for sure. Bravo Tim! A near-perfect list…. Hi Chris. Muppet Christmas Carol only just missed the cut, but I went in favour of Home Alone. The Snowman, hmm – not one of my favourites, I’m afraid. Miracle on 34th Street (the original one) for me, Tim, but I’m a big fan of Die Hard and Home Alone too. But tell me – what do you have against Elf? I love that movie! In truth, I have nothing against Elf – I’ve just never seen it and I’ve never been overly impressed with Will Ferrell. Miracle on 34th Street – a good call. I’ve only ever seen the original once – I liked it a lot – but that must have been 20 or more years ago, so that slipped beneath my radar a bit.